Former Helical Bar investment director Jack Pitman has teamed up with ex-Columbus Capital managing partner Joe Froud to launch a UK secondary property investment company. 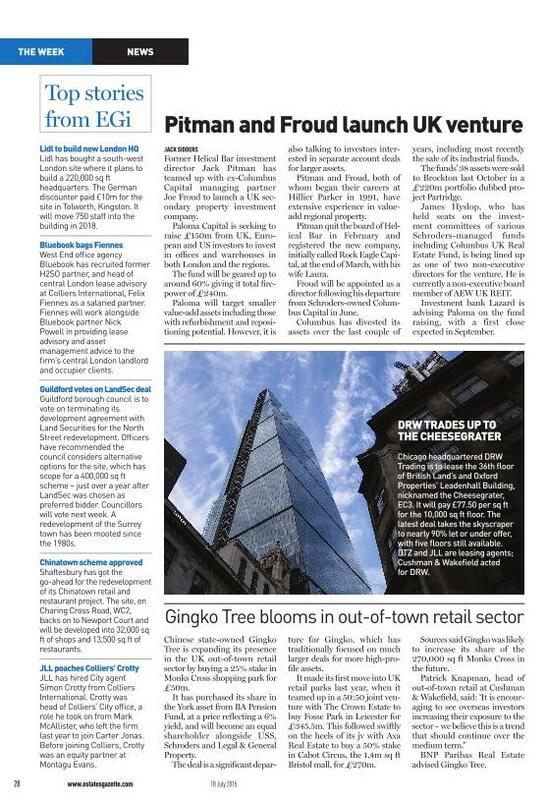 Paloma Capital is seeking to raise £150m from UK, European and US investors to invest in offices and warehouses in both London and the regions. The fund will be geared up to around 60% giving it total fire-power of £240m. Paloma will target smaller value-add assets including those with refurbishment and repositioning potential. However, it is also talking to investors interested in separate account deals for larger assets. Pitman and Froud, both of whom began their careers at Hillier Parker in 1991, have extensive experience in value-add regional property. Pitman quit the board of Helical Bar in February and registered the new company, initially called Rock Eagle Capital, at the end of March, with his wife Laura. Froud will be appointed as a director following his departure from Schroders-owned Columbus Capital in June. Columbus has divested its assets over the last couple of years, including most recently the sale of its industrial funds. The funds’ 38 assets were sold to Brockton last October in a £220m portfolio dubbed project Partridge. James Hyslop, who has held seats on the investment committees of various Schroders-managed funds including Columbus UK Real Estate Fund, is being lined up as one of two non-executive directors for the venture. He is currently a non-executive board member of AEW UK REIT. Investment bank Lazard is advising Paloma on the fund raising, with a first close expected in September.